Thanks to Vegan Lass - one of our #YHLbloggers - we have another Your Healthy Living inspired recipe for you try. 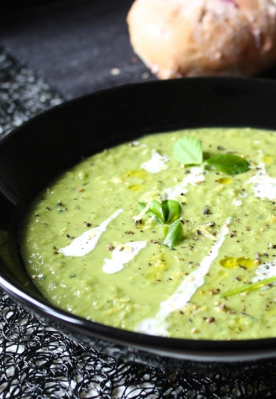 This vegan soup is fragrant and flavourful: heavy on the basil, whose flavour is preserved by being added only at the last minute, with the richness of garlic and olive oil, and a little lemon acidity. 1. Heat up the olive oil in a large saucepan or pot over medium-high heat. To this, add the onion and garlic, and fry till translucent. 2. Next, add the peas, and fry these for about a minute. 3. Add the stock, milk, and half the lemon juice. Bring the whole mixture to the boil, then turn down the heat to low-medium. Simmer for 20-30 minutes, until the peas are well-softened but still very green. 4. Take the soup off the heat, and blend either with a stick blender or in a jug blender to the desired consistency (add extra liquid if you want a thinner soup). Add in salt and pepper to taste, along with the rest of the lemon juice. Tear in the fresh basil and blend again, until fully incorporated. 5. If you need to, heat again very (very!) briefly before serving. Top with black pepper, a little olive oil, a little soy cream, a sprinkling of lemon zest, and the pea shoots. Recipe courtesy of Vegan Lass.